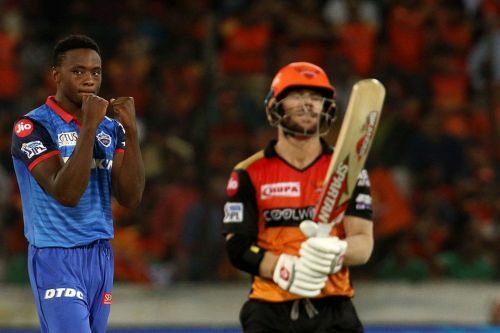 It's been only a few days since Sunrisers Hyderabad crumbled under pressure during a chase against the Mumbai Indians giving Alzarri Joseph the best ever figures in IPL. Last year's finalists have once again done it this time against Delhi Capitals. SRH openers - Jonny Bairstow and David Warner - added 72 runs for the first wicket but once Bairstow got out, things did go home team's way. Even Warner, who scored a half-century, struggled to score runs. From 101-2, they ended up getting bowled out for 116. Warner and Bairstow were the only SRH batsmen who could reach the double digits. Delhi's overseas bowlers Kagiso Rabada, Keemo Paul, and Chris Morris took 4, 3, and 3 wickets respectively. Earlier in the match, the Sunrisers Hyderabad bowlers did a good job after Kane Williamson chose to bat first. Khaleel Ahmed, who was returning to the side, dismissed both the Delhi Capitals openers Prithvi Shaw and Shikhar Dhawan in the second and fourth overs of the game respectively. Even with the fall of two wickets, Delhi's scoring rate did not come down as Colin Munro, who replaced Colin Ingram, went all guns blazing. The New Zealand batsman who was playing his first match this year scored 40 runs off 24 balls. As a result of his strokeplay, Delhi could score 69 runs in 8 overs. He looked unstoppable before edging one to SRH keeper Jonny Bairstow off the bowling of Abhishek Sharma, who was playing his first match for the Hyderabad franchise. After Munro's dismissal, Delhi could not keep up the scoring rate and ended up scoring only 86 runs in the last 12 overs. Shreyas Iyer (45, 40 balls, 5*4) and Rishabh Pant (23, 19 balls, 3*4) got in but could not provide the team with much-needed push in the final overs. Kane Williamson, at toss today, reminded of this. "Do you know captains winning the toss here lose 80% of the matches? Are you superstitious?"